For decades Contra Costa County has worked with U.S. Immigration and Customs Enforcement (ICE) to hold immigrant detainees in a county jail in Richmond. But now new legislation could change that. The county currently leases beds at its West County Jail to ICE to detain undocumented immigrants under a contract that funnels about $6 million to the county, according to Contra Costa County Sheriff David Livingston. But a state bill making its way through the California Legislature, Senate Bill 54, would end all ICE contracts and bar local law enforcement from communicating and cooperating with federal immigration authorities, except in rare cases. Livingston called SB 54 "a disaster," saying it would hamper law enforcement efforts. “We couldn't share basic information about human trafficking or other cases with ICE unless the individual has a prior conviction for a serious or violent felony,” he said. 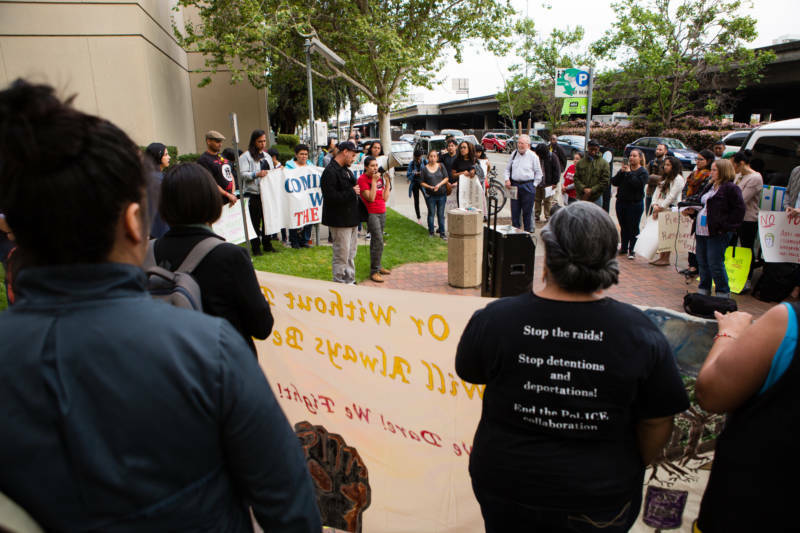 Contra Costa County’s contract with federal immigration authorities has drawn a steady stream of criticism and protests from advocates and family members of detainees. With the Trump administration ramping up immigration enforcement, California state lawmakers have drafted several bills aiming to restrict the federal government's ability to enforce its immigration policies. Another bill proposed by state Sen. Nancy Skinner (D-Berkeley), Senate Bill 630, would bar jails from using state funds for expansions as long as they also house federal prisoners, including immigrant detainees. Skinner's bill raises the stakes for counties like Contra Costa, which is currently competing for a $70 million grant to add 400 beds to its Richmond facility. On Wednesday, the Board of State and Community Corrections put Contra Costa County’s proposal -- which would include space for rehabilitation facilities -- at the top of its short list of recommended grant recipients. “We desperately need a new mental health and re-entry building in West County Jail,” Livingston said. If Skinner's bill passes, Livingston says the choice is clear: He would cancel the county's ICE contract to stay in the running for jail expansion funds. Still, he would prefer to maintain both funding sources, as they are allocated to different needs. In an interview with KQED Newsroom, Sheriff Livingston discussed in detail the county’s policies and interactions with ICE. Thuy Vu: Contra Costa has a contract with ICE -- Immigration and Customs Enforcement -- to house federal detainees at your jail in Richmond. How long have you had this contract, and why did you agree to it? Sheriff David Livingston: The contract actually began back in 1992 with the U.S. Marshals Service. More recently ICE has asked to also use that contract to hold some of their detainees in our facility, which is important to know is a dormitory-style building in West County. It is intended specifically for that type of population. They actually have keys to their own cell doors. It's minimum to low security and it's extra bed space. So we thought it prudent to go ahead and rent those spaces to ICE, generate revenue and reduce the operating costs to the taxpayers of Contra Costa County. Vu: How much revenue do you get from it a year? Livingston: Typically it's about $6 million a year. Vu: And how many detainees on a given day, a given month? Livingston: Our average is about 200 a day, although that moves day to day by as many as 10 or 20 in either direction. Vu: So on any given day, most people in your jail are there for reasons unrelated to immigration. They may be awaiting trial. They're serving time for other crimes. But in this country all inmates have their fingerprints sent to the FBI database. So once federal immigration authorities figure out that some of the folks you have there are undocumented, what do they want you to do? Livingston: So essentially anyone that's booked into my jail and for Contra Costa -- of course, we don't have a choice who comes in the facility -- everyone is booked into one of our jails. Those fingerprints are automatically sent to Homeland Security and to FBI. It's at that time that ICE determines that they may want to interview one of the persons recently arrested in my facility, for example, and they notify us that they'd like to talk to that person. Formerly they might put in a request for a hold. Holds are no longer allowed in California. We don't honor holds. If that person is subject to being released at a certain time we release them at that time. If ICE is present to interview them, we’ll allow the interview to occur. Otherwise, that person is released. Vu: Do you ever proactively contact ICE to let them know that someone is about to be released? Livingston: If there is a particular individual that has come to our attention as a violent offender or a serious offender or who self-discloses that they may be subject to ICE investigation, we’ll notify ICE that they may be interested in this person. But that doesn't happen very often. ICE typically knows who they want to interview. And by the way, when they come in to do that interview, in many cases, they do not remove the person into their custody. Vu: You know, a lot of people take issue with that, though. You've had a number of protests at your facility. People who feel it's wrong for you to do this, wrong for you to proactively contact ICE. How do you respond to that? Livingston: Well, it's a relatively small group of people. It's somewhere between 30 and 50 that appear pretty regularly to protest. My obligation as sheriff for Contra Costa County is to provide public safety to the entire county -- that's 1.1 million people. So we focus on what's best, in our view, in providing public safety to everyone, not just particular special interest groups. And we already have a policy that I have signed off on that says we will do no immigration enforcement at all for our deputies on the street. This is really about the back end when someone who is already here, undocumented, has committed a new crime and now finds himself in jail. Vu: Several cities throughout California have declared themselves sanctuary cities and now there's a bill, SB 54, a state bill that would make all of California a sanctuary state and prohibit law enforcement agencies like yours from cooperating with federal immigration agents. Where do you stand on SB 54? Livingston: I, like nearly all of my colleagues in California and the State Sheriffs’ Association, are absolutely opposed to that bill. We think it's a disaster. It's the first time that we have heard of where the state government is trying to tell us who we can talk to and who we can’t talk to among other law enforcement agencies. It would hamper our efforts in a very demonstrable way. We couldn't share basic information about human trafficking or other cases with ICE unless the individual has a prior conviction for a serious or violent felony. And so putting those kinds of restrictions on our access to our federal colleagues and partners can be very damaging to public safety. We oppose it. Vu: Supporters of the bill, though, say that the flip side of this is that there would be damage to public safety from another angle, and that is, it would make undocumented immigrants so fearful of deportation that they would be less willing to cooperate with you and other law enforcement agencies, less willing to report crimes. Vu: But wouldn’t those issues be exacerbated, though, if you keep on opposing this sanctuary bill? Livingston: I don't believe so. In fact, if we have a situation where ICE has to go now into the community to take someone into custody who may be facing a felony or a very serious charge, when they could have had that interview conducted in the safety and security of a custodial facility, that's putting more people at risk. So we believe at least working with ICE to the extent that they can conduct an interview makes sense. Vu: You're currently seeking $95 million to expand the West County facility. State Sen. Nancy Skinner of Berkeley has a bill that essentially bars state funds from being used for jail expansions in counties that hold ICE detainees. So you're seeking of this $95 million in funds could be in jeopardy if this bill passes. Your thoughts on Sen. Skinner's bill? Livingston: I think Sen. Skinner has moved the goalposts in the middle of the game. We applied in good faith for those funds to build a re-entry facility that will help those that need it most in our custody -- mental health treatment, substance abuse treatment. That's what this is about. It's a $70 billion grant with matching funds that the county would come up with. The grants will be awarded as early as next week. It's a very competitive grant and we've had this contract with ICE for many, many years. So to now say, well, if you received the grant funds you're not going to be able to have contracts with any federal agency, I think is just patently unfair and it's inappropriate. Vu: All right, Sheriff David Livingston of Contra Costa County, thank you so much for being here. Sheraz Sadiq, Julie Small and Lisa Pickoff-White contributed to this report.